Early this morning I decided to make a backup of my external-facing Tableau Server to get ready for 9.2. The box is an older 4-core i5 consumer machine with 32 GB of RAM that has a great low-power mode – good for running low-concurrency, low-complexity workloads without paying the utility company tons of cash. While watching 7-Zip churn away against my extracts (my final backup file is generally about 3.1 GB), I thought it would be fun to raise the priority of the 7z.exe process itself. I used Task Manager to set it’s priority to “Real Time” not expecting much to happen since “Real Time” mode doesn’t generally effect CPU utilization of a process (unless there is already contention). You should almost never use REALTIME_PRIORITY_CLASS, because this interrupts system threads that manage mouse input, keyboard input, and background disk flushing. This class can be appropriate for applications that “talk” directly to hardware or that perform brief tasks that should have limited interruptions. …But I’m the boss of me, so I just went for it. Well, I was surprised to see that backup finished much more quickly than usual. Wow. Very surprised. FYI, I also noticed that at times my screen stopped refreshing, keyboard was non-responsive, etc – Real Time at work, I guess. So there’s definitely something going on here. Interesting. Next I tried a different Tableau Server running on Parallels on my Mac (i7, 4 core) – I saw no difference in backup time against a very similar collection of workbooks and extracts – backup completed in about 4.5 minutes in both cases. So it appears that there may be some sort of a sweet spot for tinkering with priority on older hardware that doesn’t get completely maxed out while doing a backup for you. This trick and a million bucks will get you a million bucks. Use at your own risk, of course. wow, thanks for sharing! I may try it out on one of my test boxes. 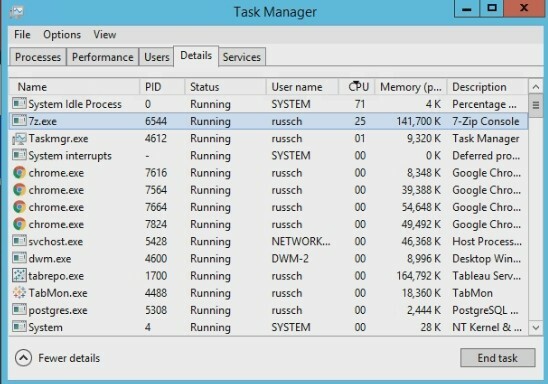 Is there a way to up the priority of a process within a script instead of doing it manually within task manager? ::Script Provided as is. No warranties. Please Test before implementing. echo 7 zip set to ludicrous speed! I suspect that you could do this, but it wouldn’t be a simple (batch) type script – maybe PowerShell would give you access to the API you’d likely have to use, but I’m not sure.